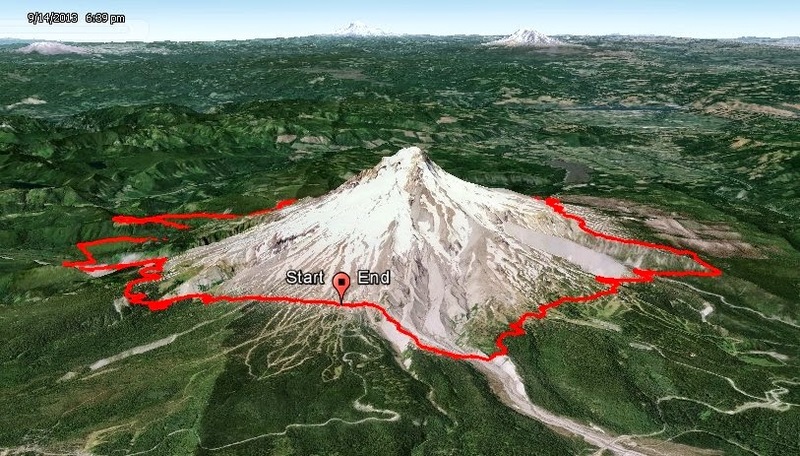 Directions: Take one huge mountain, add ~42 miles of trail, season with ~10,500 feet of gain, add icy river crossings, and bake gently for ~12 really fun hours. Share good times with friends. It was a little over a month ago, the other side of the world from now, when we found ourselves closing in on Portland, Oregon. 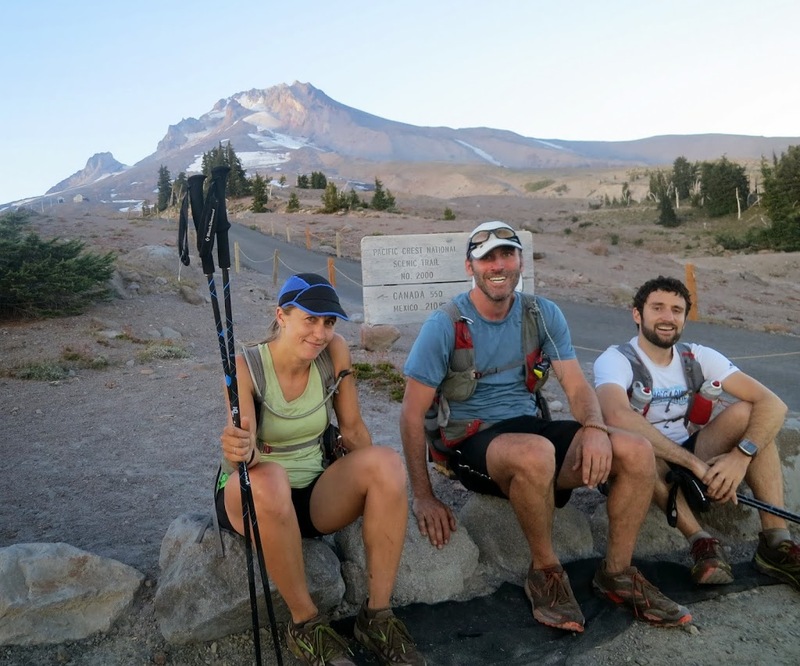 Our legs were still sore from the Grand Canyon six days prior, but the magnetic pull of Mt. Hood was impossible to resist. Running around a huge mountain seems pretty ridiculous at first pass. 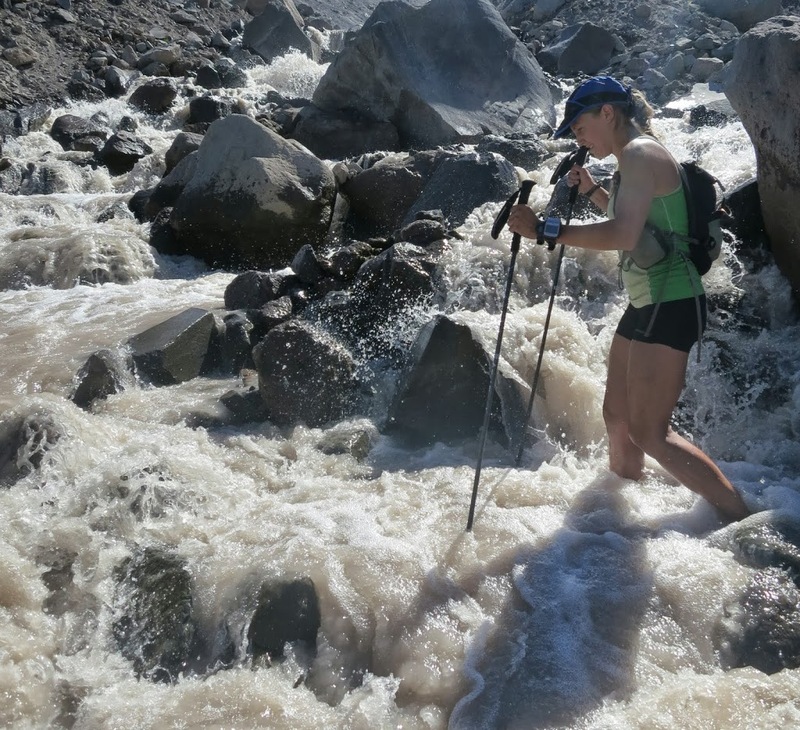 But the reality is you get to see every facet of the mountain, from stunning valleys carved out by glaciers, exhilarating river crossings, huge undulating ridges, and views of the summit from every possible angle. Prior runs around Mt. Helen’s, Mt. Kilimanjaro, and Mt. Adams had been extremely fun. 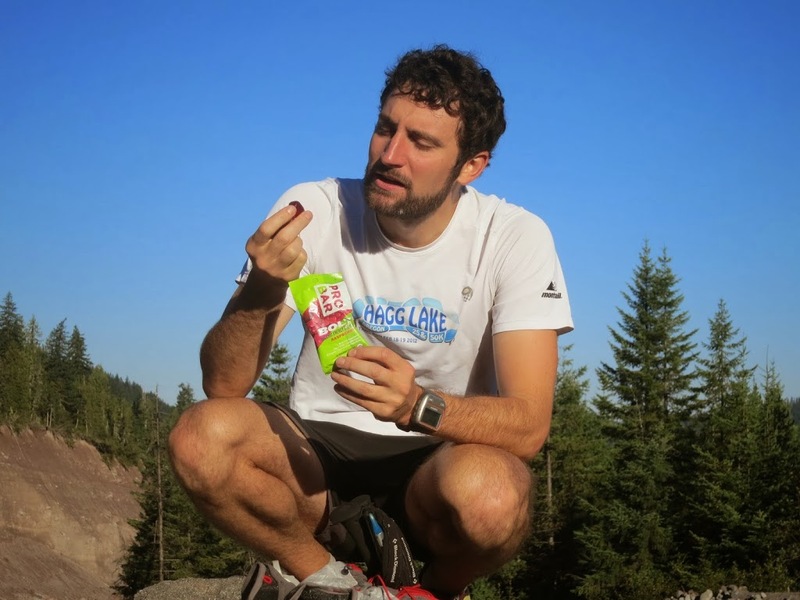 And inspirations were not hard to find among our running friends, especially Yassine Diboun who had just set the fastest known time running around Mt. Hood unsupported – in a crazy 7 hours and 47 minutes. Our goals were more sedate, aiming for 12-13 hours with lots of picture stops. 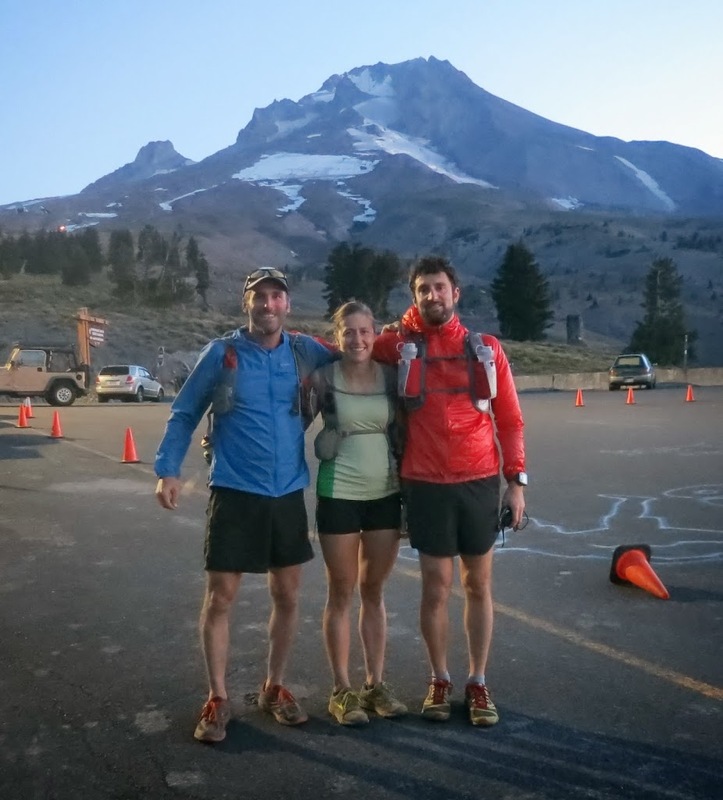 So, that is somewhat how we found ourselves in the parking lot at Timberline Lodge, about an hour east of Portland, adjusting our running packs as dawn stretched across the distant mountains. Almost up to the last minute we debated what direction to run. 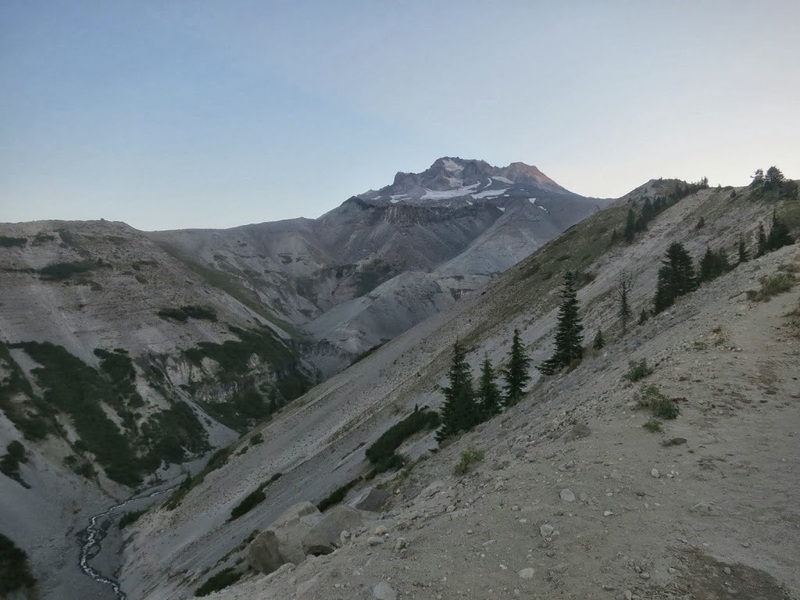 It was forecast to be 90F, going counter clockwise would mean running through the exposed sections of mountain while it was still morning cool – and then finish the hottest part of the day with some shade on the western side. But it also would leave the largest river crossing for later in the day. Do it became: Heat vs Nasty River Crossing. And so we ran clockwise, opting for a safer crossing of the Sandy River and potentially getting fried later in the day. We were about 15 miles in – curving around the north western flank of the mountain when things really slowed down. My legs were already feeling stiff, Nichole was in similar shape. And it made sense, since the pounding of the Grand Canyon still echoed in our bones. Recovery times are really hard to estimate and I think we both realized around the same time that we had possibly bit off a bit more than we could run. But it isn’t easy to bail when you are in deep on a home rolled adventure. Unlike an organized run, there are no aid stations to cheer you up, pacers to rally you, or volunteers to give you a warm ride back to the start. 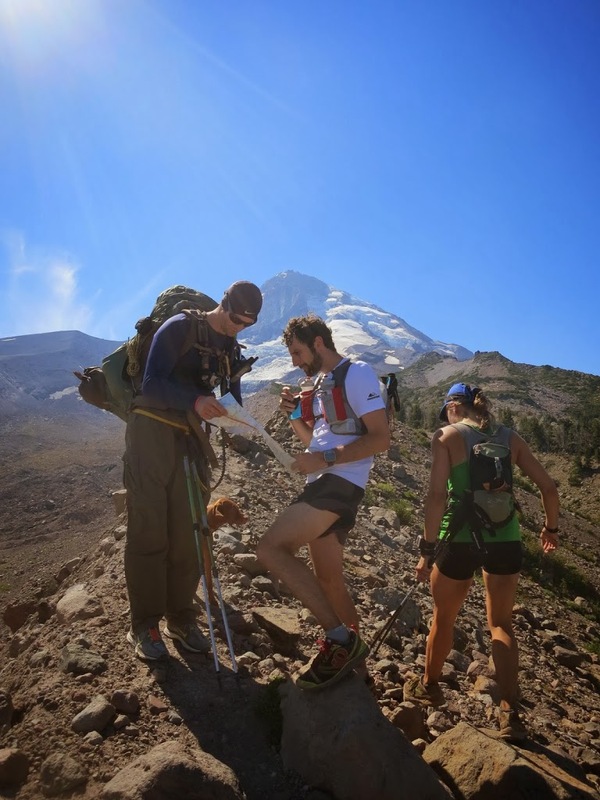 Fortunately for us – the cold river crossings gave us the jump start we needed and we had an amazing day led largely by Matt who is incredibly strong and had been great company (and a great navigator) a month or so prior while running up and around Mt Adams. In the end, we covered ~42 miles and ~10,500 feet of gain on beautiful trail. 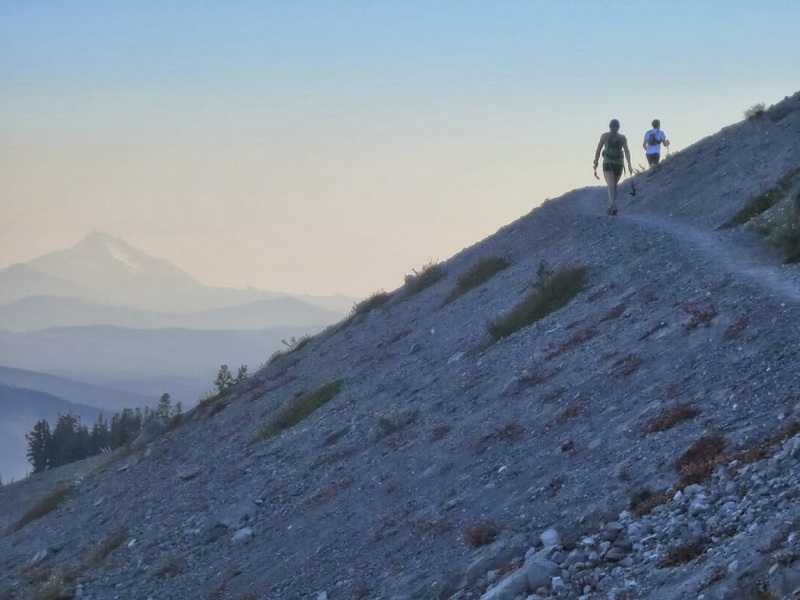 We stuck to the Timberline Trail and the PCT on a few sections – avoiding short cuts because a) none of us had the prior energy to research them and b) we liked the idea of running the official circuit route. Dubbed ‘harder and better’ by Nichole then the Grand Canyon – we finished in a little over 12 hours. All in all it was an epic day. I think we only took about 3 real breaks where we sat down for ten minutes or so. We just kept pushing and pushing- admiring the angles and changing face of the mountain as we circumnavigated it, crossing huge valleys and lava fields. A full set of pictures (n=27) can be found in this online album. When we finally reached Timberline Lodge again the sun was just setting. We hobbled inside and up two flights of stairs where well dressed diners were enjoying the sunset. 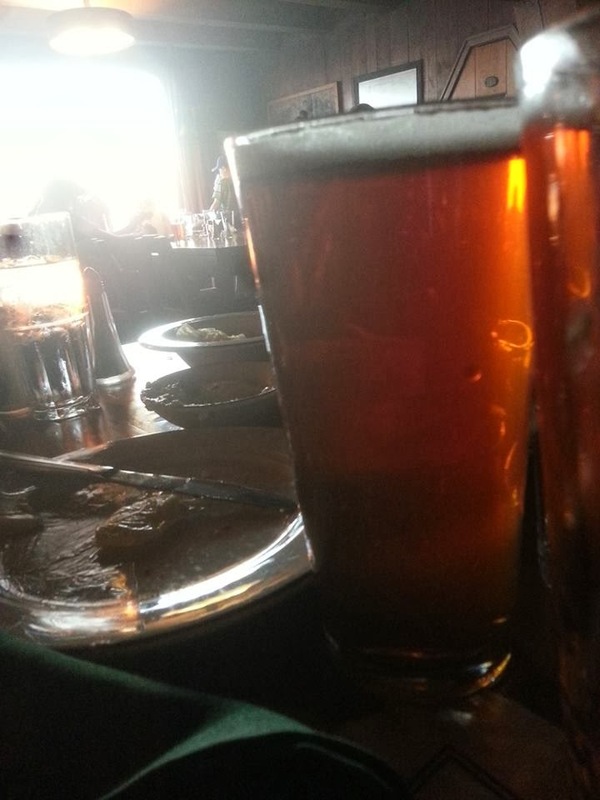 Beer never went down so quick but we opted for showers, beer, and pizza back in Portland at Matt’s place. We stiff legged our way back down the stairs to the front doors. Somehow a race from the lodge to the car in the parking lot ensued. I came in last but it was still a great day. Our route, GPS tracks in Google Earth. thanks PROBAR for fueling this adventure. Hi, Seth! Always LOVE reading your posts! I never am able to comment, somehow, but I always try! If you are still with Dorjee tell him I’ll be writing soon. 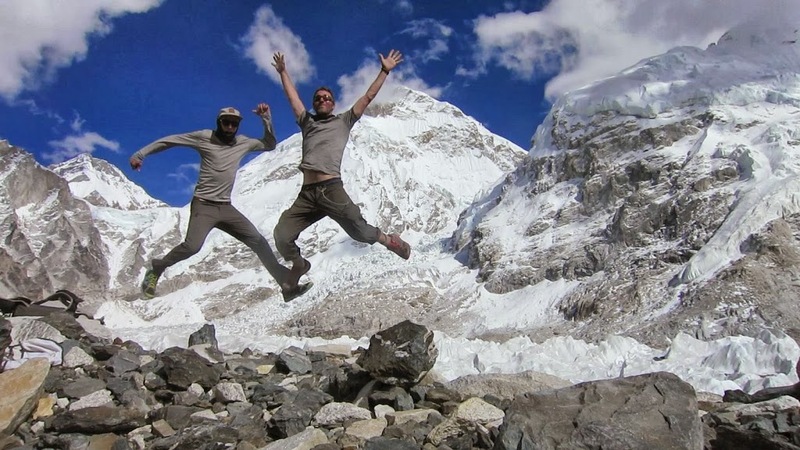 We will be trying to put the Annapurna circuit trip together for March 2015. Already have 5 people ready to go and Lee’s eye is slowly getting better.. He has 2 more people possibly lined up. So, if they can all stay healthy it will be a full trip. Inspired…I’d really like to do this one. Hope things are going well in K-du!